Imagine opening your pants and revealing a vibrant world where unicorns frolic in flowery fields beneath perfect rainbows. That's the experience promised by these boxers. On the front of the wrapper you'll see the title - "BEHOLD MY MAGIC HORN"
All of my boxers are full-cut with a three-panel design (no center back seam) and a functional fly. I make all of my products in a smoke-free home, I only use woven 100% quilter's quality cottons, I prewash all fabrics before I cut so the finished garment stays true-to-size, and all interior seams are finished by flat-felling. 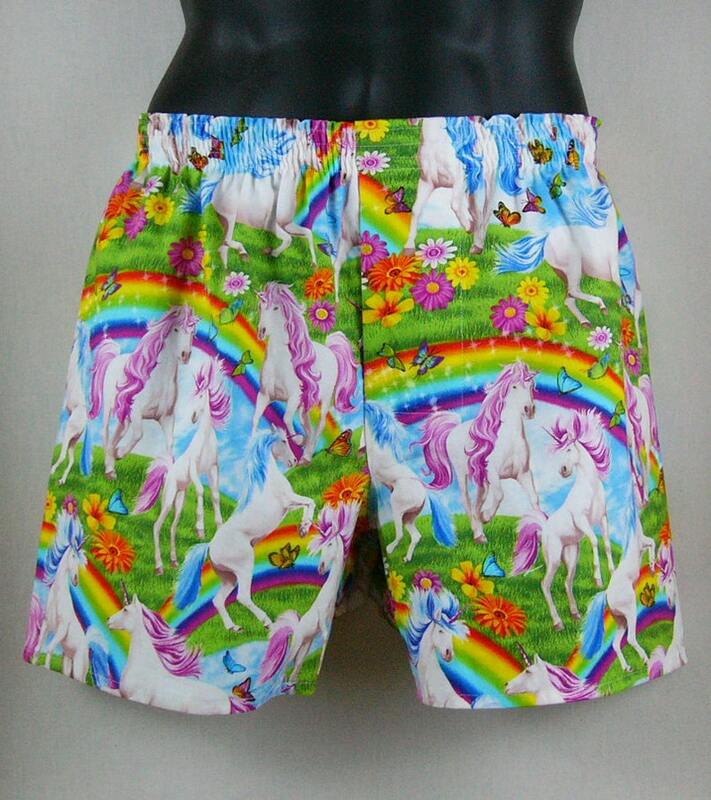 These are some quality underpants... magical fancy pants! This is my third purchase of Bonus Pants, and I love them. Great designs, sturdy and long lasting. also comfortble and warm. Yes, they shipped quickly too; can you see why I love them? Very summery, colorful and humoristic! High quality work and very comfortable, recommended!